A group of like-minded advocates for people with profound and multiple learning disabilities came together several times in 2016, in order to identify a means of ensuring a stronger voice for people, at a national level, and to aim to ensure that people received good quality service and support regardless of where they lived and who was providing their support. ‘Supporting people with profound and multiple learning disabilities’ CORE & ESSENTIAL SERVICE STANDARDS is an excellent resource in order to ensure that people with profound and multiple learning disabilities have access to consistent high-quality support throughout their lives, when supported by any service provider. The resultant new (2019) Ofsted framework which highlights the centrality of the 3 I’s of ‘intention, implementation and impact’ fits perfectly with Equals’ stated ambition within its Semi-Formal Curriculum, for all teachers to ask key questions of their daily work, namely (i) why am I teaching what I’m teaching (ii) what am I trying to achieve and (iii) am I making a difference. ‘schools already have the freedom to use any curriculum they feel is appropriate for the needs and requirements of …… pupils (not engaged in subject specific learning)’ (Rochford Review, 2016, p20). ‘…children, young people and adults with severe or profound learning difficulties will not succeed in the National Curriculum, or indeed, in any curriculum model designed for neuro-typical conventionally developing learners. They will not succeed because they have severe or profound learning difficulties. It is not possible for them to succeed. If they could succeed, they wouldn’t have severe or profound learning difficulties’ (Imray and Colley, 2017, p58). Such sentiments echo previous suggestions that a curriculum geared to the norm cannot be an appropriate model for those 70,000 or so learners with PMLD and SLD who make up less than 0.8% of the whole school population in England and Wales (Pinney, 2017) yet have the greatest complexity of need. ‘By definition, exceptional students require an extraordinary response from educators – something different from the ordinary, even if the ordinary is good………Failure to create these explicit structures to accommodate students at the extremes of performance distribution inevitably results in their neglect. They are forgotten. They don’t just fail a little. They fail a lot, and their noses are rubbed in their failures.’ (Kauffman, 2002, p259). This school acknowledges that there is a growing interest in the concept of a multi- tiered curriculum approach which sees Pre-Formal and Semi-Formal curriculum models working in with the existing Formal model that is the National Curriculum. It is known that a number of Ofsted ‘outstanding’ schools such as Priory Woods School in Middlesborough, Melland High School in Manchester, John F Kennedy School in Stratford east London, Three Bridges School in Bath, St Ann’s School in Hanwell, west London, Columbus Grange School in Sunderland and The Russett School in Chester, just to give a few examples, have already, or are in the process of, adopting this approach. All of these schools run the Equals Semi-Formal Curriculum (Equals, 2018) and we feel that this model, which Equals regards as the only curriculum in the world written specifically for children, young people and adults with severe learning difficulties, gives us a solid base on which to move forward. In the model above, it is neither necessary nor advisable to adopt a hard line on which curriculum might be appropriate for each learner as it is evident that learners on the edges of a learning difficulties spectrum, such as are described by the terms PMLD, SLD or MLD, may benefit from some involvement in the adjacent curricula. That is, those assessed as P3 (i) and (ii) may benefit from some elements of a semi-formal curriculum; those on P4 or P5 from elements of an informal curriculum; learners working at P8 or L1 may well cover some elements of a formal curriculum. Similarly, learners working consistently and over time at levels at or even above L2 may still benefit greatly from elements of a semi-formal curriculum, especially in for example, independence. There is therefore a fluidity about this model which both allows for and encourages a personalised (or individualised) approach, whilst still recognising that core elements of each curriculum will broadly fit the learning needs of all learners within the PMLD and SLD spectrums. The logic behind this approach comes from the sure and certain knowledge that our learners can make progress within curricula specifically designed for them, but will struggle to do so within curricula that is not (Imray and Hinchcliffe, 2014). We believe that the nature and extreme complexity of both the severe and profound and multiple learning difficulty spectrums, as well as the absolute necessity of extensive repetition being built in to the learning process mitigates against fulfilling one’s potential in both academic and alternative curriculum models. Such ‘dilemmas of difference’ (Norwich, 2008 and 2013) mean that choices have to be made, because not making such choices leaves insufficient time in the school life of the learner. For us, the argument is made by the fact that, by definition, the very best that can be achieved by the most able on the SLD spectrum within a National Curriculum model (that is, fulfilling their academic potential) is equivalent to the start of the academic model, and for most on the SLD spectrum and all on the PMLD spectrum, well below the start. It seems self-evident that to have one’s ambitions limited to the start of a curriculum indicates that it is the wrong curriculum. This also opens up another debate about the relevance of neuro-typical (mainstream) time frames. There is some logic to seeing the validity of a curriculum framework as being in its ability to prepare the learner for the next stage, whatever that might be. In UK mainstream terms, there is a fairly seamless transition from 3 to 5 (early years), from 5 to 11 (primary), from 11 to 16 (secondary), from 16 to 18 (sixth-form), from 18 to 21 (university) and then on to work. Each curriculum model builds on and extends from the last. These time frames however do not make sense and therefore cannot apply to those on the SLD or PMLD spectrums, because of the degree of repetition required, the difficulties with communication and cognition, and the naturally extended time required for progress to be established within independence, fluency, maintenance and generalisation (Sissons 2018) even within a specific SLD or PMLD curriculum model. For these learners the key ages are 2 or 3, when they enter the education system and 19 when they leave it. It is not an accident that the majority of UK special schools specifically for those with SLD and PMLD cater for the 2 to 19 age range, and see this as a perfectly normal and sensible arrangement. For learners on the SLD spectrum, there may be some logic in delivering a broadly academic framework, particularly within literacy and numeracy, until the age of 8 or so, because this would allow sufficient time (i) to assess the accuracy of a SLD or PMLD ‘diagnosis’ and (ii) to make a reasonable judgment on academic potential. A reasoned, informed, experienced and expert multi-disciplinary judgement can then be made, and if it is assessed that a non-academic route is more appropriate, still leave 10 or 11 years to concentrate on a specialised SLD or PMLD curriculum model. Our conclusions on curriculum and curriculum design are therefore that the current school cohort (and indeed, cohorts for the foreseeable future) are not best served by the National Curriculum alone. Our experience, concurring with a number of outstanding special schools, has led us to adopt a much more flexible and personalised approach which sees the curricula on offer changing to meet the needs of the pupil rather than the other way round. The learner must be at the centre of curriculum design. Returning to the Rochford Review and its primary function of determining on assessment for learners working consistently and over time below age related expectations, we believe that there are a number of other key statements. That is, schools should be responsible for determining the best way to assess the attainment of their particular pupils, and that this must be an ipsative judgement, rather than one which is comparative to other learners. This is an important statement, as it establishes that attempts to design assessment schemas by using estimations of ‘expected’ progress over a specific time period (such as was used with the P scales and other variations of this, notably Pivats and B Squared) are not effective and can often be counter-productive in their tendency towards assessment led teaching. ‘Assessment is a good master but a terrible servant……..Too often we start out with the idea of making the important measureable, and end up making the measurable important.’ (Williams, 2015). 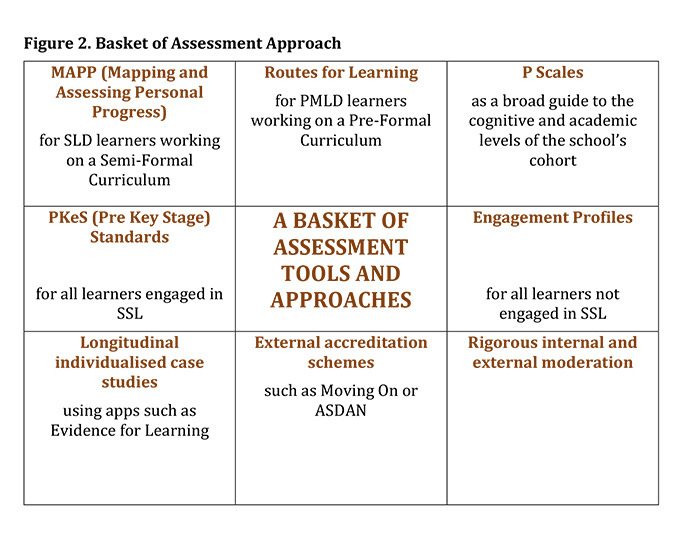 With this in mind we have adopted a wide ranging ‘basket of assessments’ after the approach mooted by Swiss Cottage School (2014) see Figure 2 below. (iii). the assessment schemas used need to reflect the curricula on offer and the effectiveness of teaching, but must not drive either. Equals (2018) The Equals Semi-Formal Curriculum. Newcastle. Equals. HMCI (2018) HMCI commentary: curriculum and the new education inspection framework. Available at wwhttps://www.gov.uk Accessed 10th October 2018. Imray P and Colley A (2017) Inclusion is Dead: Long Live Inclusion. London. Routledge. Imray P and Hinchcliffe V. (2014) Curricula for Teaching Children and Young People with Severe or Profound Learning Difficulties. London: Routledge. Kauffman J M. (2002) Education Deform: Bright People Sometimes Say Stupid Things About Education . Laham, MD: Scarecrow Press. Norwich B. (2008) Dilemmas of Difference, Inclusion and Disability: International Perspectives and Future Directions. Abingdon, Oxford: Routledge. Norwich B. (2013) Addressing Tensions and Dilemmas in Inclusive Education. London: Routledge. Sissons M (2018) MAPP. Mapping and Assessing Personal Progress. Newcastle, Equals. Swiss Cottage School (2014) Progression Planners. Meaningful Assessment for learners with Special Educational Needs and Disabilities. London. Swiss Cottage School Development and Research Centre. https://www.teachprimary.com Accessed 23rd April 2018. For those with a profound learning difficulty, learning is best done when the learner is placed at the centre of the Curriculum. A Person-Centred and Holistic Curriculum for Learners with Profound and Multiple Learning Difficulties. 2. The qualitative evaluation has been published around the 7 aspect of engagement please see the link below. Whilst there were a number of positive outcomes from members who are part of school hubs there were also concerns around workload and it is likely that the pilots will run until 2020. A number of members will develop some questions around the aspects of engagement which will be put before Andrea Imich when he next attends the National SEND Forum. Exemplification for the Pre Key Stage Standards with annotated notes and videos should also be available soon. 3. OFSTED framework – a much more positive framework which allows schools to take greater responsibility for the development of the curriculum and personalise learning to meet pupil needs. (See link below). It will also provide opportunities for Inclusive school to attain outstanding and not be held back by attainment data. Some concerns were noted around lack of inspection notice related to pupil disruption and the need for greater flexibility around behaviour. 4. The UCL report implications for Whole School Send around the special needs index is now in draft form and should be out shortly. It contains National/Regional and LA data sets on aspects of SEND from EYs to Secondary aged students. 5. New schools Network – The Local Authority led wave 2 new free special schools window and materials should be out early 2019. I will inform members of the next main agendas items and please do identify any issues or questions that you would like me to raise at the meetings on your behalf as a member of EQUALS. I have recently had a query sent to me by a colleague working in an all age special school who have just decided to move over to an Informal, Semi-Formal, Formal Curriculum model, and it struck me that the issues raised relating to the time devoted to Literacy and Numeracy and their relative importance, might be of interest to Equals’ members. The teacher’s questions are in italics followed by my suggestions. My main concern is for the ASD pupils who have reading/math levels that are old L1. How do you suggest that we support those pupils in the lessons to ensure that they do not lose those skills? Do we teach them a formal curriculum for those subjects? I am concerned that if we don’t continue to teach them those core subjects using the formal curriculum, then they will lose those skills! 1. Age – I would be more inclined towards the formal curriculum model the younger the learner is and by extension, less inclined the older the learner is. Generally speaking, if the learner hasn’t got number by the time they’re 8 or 9 and certainly by the time they’re 11, they’re probably not going to get it to a level that will help. Learners MUST have an abstract understanding of the relationship between every number and every other number if they’re going to have a chance of being numerate, otherwise it just tends to be learning by rote. Rote learning also of course, comes in to reading, and again, learners really need to understand that words themselves are merely abstract symbols representing ideas that are put together to form ever more complex thoughts. The ability to read, so often apparent in learners with ASD, does not signify understanding, otherwise I would be able to understand Stephen Hawking’s A Brief History of Time, which I can’t. I can read the words, but have no idea what they mean! The thing about such rote abilities is that they open teachers up to dilemmas of difference – do I carry on teaching literacy and numeracy in the hope that the learner eventually gets it or do I follow a different model knowing that the learner can and will succeed at that? Unfortunately there is no right answer, but I’m not certain that you will be able to do justice to both because both will take up SO much time. 2. Current ability and levels and 3. Potential can be more or less taken together, because both numeracy and especially literacy only really start to make sense from a position of positively helping with ordering and living our lives – that is, helping us to make sense of the very complex world around us – when we get to around level 4 of the National Curriculum, a position achieved by most neuro-typical 10 year olds by the time they leave primary school. If children haven’t already or are not going to (in your and others’ professional opinion) get to those dizzy heights, there doesn’t seem to be much point in spending large amounts of time pursuing the ambition. You may however, spend small amounts of time doing it, and how large or small will be decided by how much this additional work impinges on their making progress within the semi-formal curriculum. Of course the other very important issue that we mustn’t forget here is that simply because you’re not teaching formal Literacy and Numeracy does not mean that your learners are not improving their literacy and numeracy skills. Maths is everywhere and in every thing. All learners will learn HUGE amounts of maths by being able to successfully cross a road, make a pizza, kick a ball, take their feet off the bottom of the pool, traverse across the hall. One doesn’t have to learn formal maths to learn maths! Similarly, we tend to forget that literacy is merely a higher and more complex form of communication, because that’s what it is – communication. Stephen Hawking has not managed to communicate with me and obviously, the complexity of the language used means that he wasn’t trying to communicate with me in the first place. If he was, I have to tell him that he’s failed abysmally! Is that my fault – no! It’s his fault because to be effective and therefore meaningful, the communication MUST be understood by both parties. If it’s not, what’s the point? 4. The individual learner’s particular interest is I think also a key factor – do they like reading, counting, doing sums? Some do, and if they do, why not carry it on, though again how much time you spend on this depends on how this will impinge on their successes in other areas. Finally, on losing skills, my view would tend to be that rote skills not practised tend to stay pretty solid over time and will come back once practice recommences. That’s what makes them rote skills. And anyway a little bit of practice will largely keep them intact. In summation, there is unfortunately, no definitive answer – it is a dilemma and dilemmas tend not to have easy answers otherwise they wouldn’t be dilemmas! Trust your judgement as a professional of long standing and experience. Trust the judgements of others you trust – your Senior Leadership Team, your TAs, SaLTs, OTs, Physios. Make a collective judgment on where you think the learner will be academically in 5 years time if you just carried on with a formal curriculum. This may not be entirely accurate (what forecasts are?) but given experience and knowledge you are likely to be broadly correct, that is, within a P scale or two. Trust that collective judgement and make your decisions accordingly. Budget cuts and school finances, are a major agenda item for schools across the UK at this time, and the ‘National SEND Forum’ have not only recognized and acknowledged the importance of this, but are attempting to campaign on behalf of schools, to help address this issue/concern. The National Special Educational Needs and Disability Forum is a regular meeting of the leading representatives of significant national organisations in this field. It is attended by the Department for Education. The National SEND Forum (NSENDF) is politically neutral, drawing together the providers, champions and commissioners of services for the most vulnerable in the maintained, non-maintained and independent sectors and across the 0-25 age range. The Forum is facilitated and convened by the Federation of Leaders in Special Education. The letter below has been sent to the Rt Hon Philip Hammond MP by ‘The National Special Educational Needs and Disability Form’. I am writing to you on behalf of the National Special Educational Needs and Disability Forum (NSENDF). We are an organisation bringing together leading representatives of significant national special educational needs and disability (SEND) organisations at both national and local level. The National SEND Forum (NSENDF) is politically neutral, drawing together the providers, champions and commissioners of services for the most vulnerable across the 0-25 age range in the maintained, non-maintained and independent sectors. We meet regularly to discuss the issues that are arising across the country within education, health and social care that impact on children and young people with SEND, their families and the professionals who support them. At a recent meeting there was much discussion again about the funding crisis that is currently being experienced by all local authorities and healthcare trusts. This is having a significant impact on the education, health and well-being of the most vulnerable children and young people in our schools. The SEND reforms that were introduced in September 2014 have been slowly implemented over the last four years; the promise being that education, health and social care would work in partnership to support the county’s most vulnerable children and young people aged 0-25. At exactly the same time we have seen an erosion of funding from all public sector departments trying to do more with less. To put this expectation of doing more with less into perspective, there is little in public policy that reflects evidence of the government’s own departments taking account of the increasing numbers, identification, novelty, frequency, severity, complexity and longevity of special educational needs and disabilities in both the child and adult population. We appreciate the constraints of public finance but without sufficient funding and a more coherent approach, the Children and Families Act 2014 and the SEN Code of Practice 2015 are nothing more than empty promises from the government to parents and children. There are a number of local authorities who are struggling to set a balanced budget for the next financial year and this is having an impact on the amount of funding that is going to be available to schools in the next twelve months. Many local authorities have deficits in their high needs budget and since there is no longer the opportunity to transfer significant sums of money into the high needs budget from other sources it is going to be very difficult for these to be balanced in the foreseeable future. There are a number of factors that have led to this crisis, all of which need to be considered when allocating high needs funding to local authorities and subsequently schools. In 2017 the number of pupils with special educational needs and disability (SEND) increased from 1,228,785 (2016) to 1.244,255 and then again in 2018 to 1,276,215. This is an increase of 47,430. With the introduction of the SEND Code of Practice 2014 we saw the SEND system expand to all pupils aged 0-25. This meant an additional number of pupils identified with SEND between the ages of 0-5 and 19-25, however no additional funding was allocated to support this expanded number of pupils eligible for support. The number of pupils with an EHCP and attending a special school has also risen over the last two years by 2% with a greater number having to access non-maintained and independent schools due to their complexity of need and lack of local provision. Every local authority has seen a significant loss of specialist support and provision much of which is now traded and commissioned. This means schools are having to “buy-in” costly support at a time when their school budget is being drastically reduced. The amount (£10,000 per place) that is provided for special schools has never been reviewed and is now insufficient to meet the needs of many complex pupils who require not only additional educational support but have significant medical and personal care needs as well. The notional SEND budget introduced in 2013 is formulated through a calculation based on prior attainment, free school meals and deprivation. This has nothing to do with how many pupils a school may have to be supporting on SEN Support or with an EHCP and yet every school is expected to find up to the first £6000 of additional provision for every-one of their SEND children and young people. This is funding that comes from the school’s block and is not ring-fenced so can and is being used to fill the gap that schools are seeing in their budget allocation. We cannot forget the number of young people experiencing significant mental health issues with no access to CAMHS and the rise in the number of SEND pupils who are excluded, off-rolled or home educated. We know from many years of research and evidence that early identification and intervention is the key to support children and yet the number of children identified in early years is still very low. Many local authorities have not been able to fully introduce the two-year development check for all children as promised by the Children and Families Act 2014. We have seen significant closures of resourced provision or specialist bases situated at mainstream schools – what happened to inclusion? having to provide services delivered by health professionals but paid for from an education budget. This is not right at a professional, moral or ethical level. The funding crisis in schools is not only about cuts to education budgets but also the cost to the most vulnerable children and their families of cuts to a range of critical health and social care services as well. We urge you to re-consider the funding that is being allocated to local authorities and health services to ensure that we do not let down our most vulnerable citizens of the future. The DfE is funding a ‘SEN/D Workforce Development [DSWD]: Project-Whole School SEND’. This is an important opportunity for you as a practitioner and schools in general to influence and inform how their needs in this area are to be met. Thank you for taking the time to read this carefully. 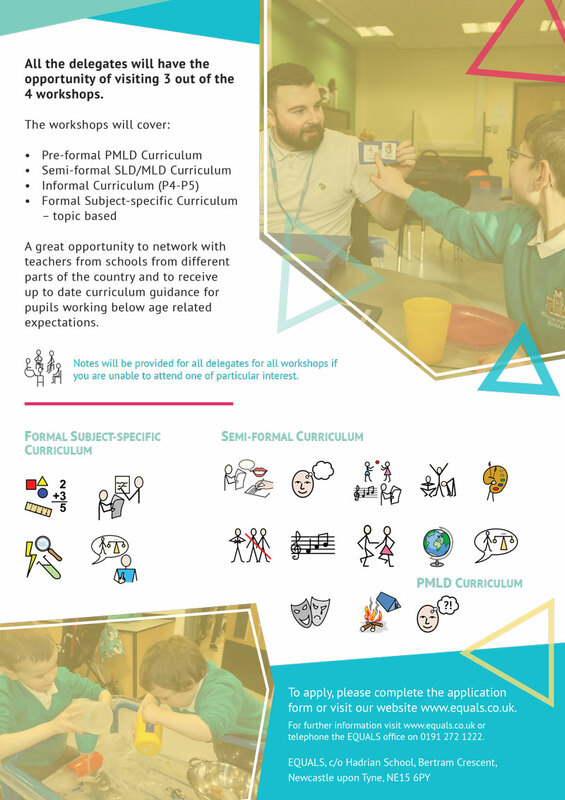 The focus of this invitation is for colleagues working in all phases of schooling in England only. A survey has been created to give insight into the factors affecting your engagement with special needs and/or disability [SEN/D] related training and Continuing Professional Development [CPD] in school/ setting; how your school/ setting identifies, accesses, uses and follows up on training /CPD; who makes those decisions and the impact they have on the SENCO, Head teacher and teaching staff roles, workload and activity. The organisation(s) sending you this invitation will not see your individual answers and will not be involved in processing or analysing the information / answers you give. This will be done by the research team at UCL IOE Centre for Inclusive Education. You are not asked to identify yourself or your school/ setting in the questionnaire: your contribution will be entirely anonymous and participation is voluntary. Your opinions and experiences are really important to us.